She's Fantastic: Women of Halloween - BRIDE of FRANKENSTEIN! This version of the Bride of Frankenstein was a Toys 'R Us 8" exclusive from Diamond Select Toys in 2011. This figure is wonderful, but it has one major construction flaw - the weakest neck peg I have ever encountered on an action figure. I broke the head off on three of these. The first one I bought came broken and the head rolled out of the package as I opened it. I returned this and bought another, which I broke myself while removing her gown to expose her mummy body. I glued it and sold it as a repaired piece and bought my third. When that one broke from toppling over on a shelf, I just glued her together and resigned myself to never displaying her mummy form. This picture below (swiped from the internet) looks like her head is snapped off as well. It seems to be a design flaw effecting all figures. She came with a figure stand and electrode poles as shown in this solicit pic. The next figure up for review is the 8" Universal Studios Monsters figure from Sideshow Toys 1998. The version was the best BoF figure out there for more than a decade. 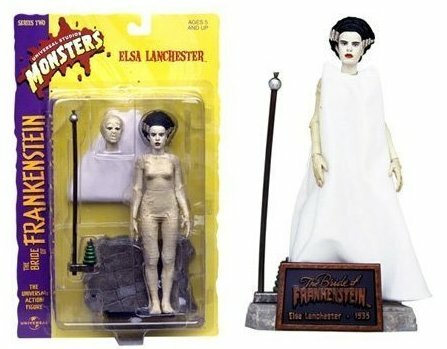 Technically, her face looks a lot more like Elsa Lanchester than the newer DST version, but in comparison, the Sideshow version looks too friendly. Fortunately for me, this figure comes with an awesome second mummy-wrapped head! 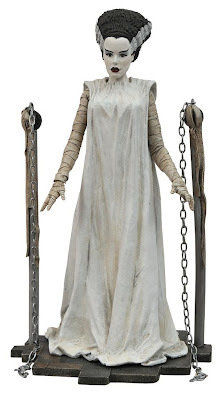 She also came with a base, and electrode pole, and a white cloth gown. I always dislike cloth gowns on my figures. 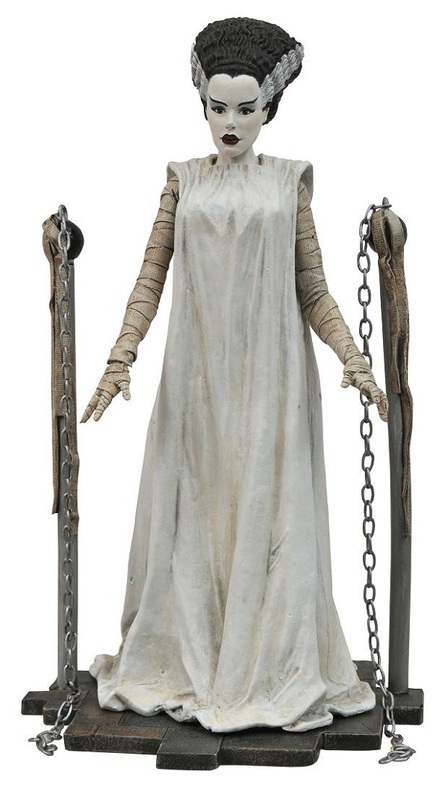 So that, combined with the mummy head and the superior sculpted gown on the new DST figure, made it an easy choice for me to keep this figure displayed completely in mummy form. (This figure was also released in a glow-in-the-dark form and a black & white "silver screen" edition). 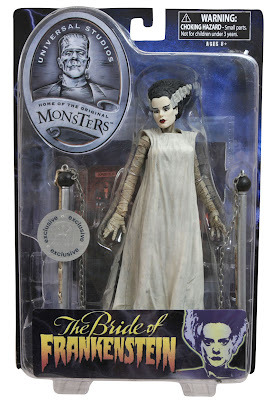 Finally we have the Diamond Select Toys Universal Monsters Mini-Mate from 2011.